Evergreen to deciduous, 1V2 to 2 ft. (45 to 90 cm). Zones 6 to 9.
description: The rhizome is erect. Dark burgundy colored, grooved stipes have ebony scales on swollen bases and are one-third or more of the frond length. Matte green, triangular blades suffused with maroon are bipinnate with 9 to 15 pairs of pinnae. It is significant that the pinnae are not stalked. The pinnules are lobed and have a thumblike auricle, the ear ofthe common name, adjacent to the rachis on the upper interior side. Sori and indusia on the veins are half-moon-shaped and arranged in an Asplenium-like herringbone pattern. 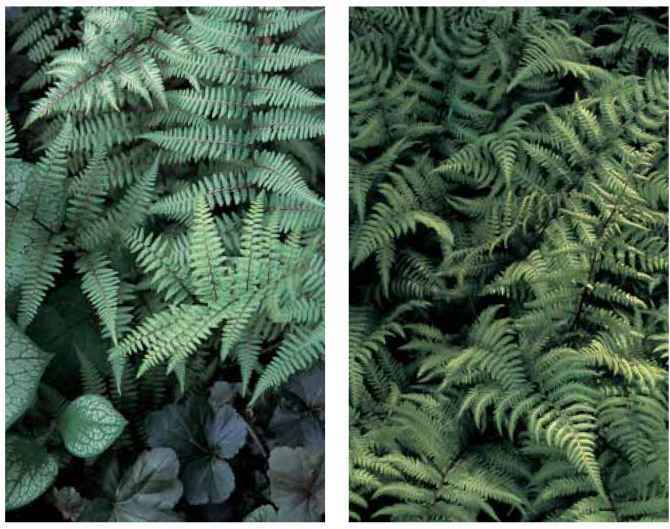 range and habitat: This is a colorful fern of woodlands in Japan, Korea, and China. Athyrium 'Ghost' with its predominantly gray foliage. Athyrium 'Branford Beauty' in the gardens at Cornell Plantations. plantings in the springtime giving the root system an opportunity to expand before the onslaught of whatever hardships winter may (or may not) present. Elsewhere it can be planted in spring or fall without concern. New growth with radiant lime and burgundy fronds suggestive of blended raspberry and lime sherbet swirls is early in the Pacific Northwest, but late in the eastern United States. 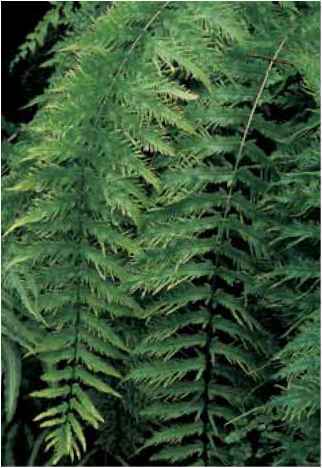 As the fronds age, the lime softens to a more subdued gray-green patina, gray being a distinguishing feature of maturity. In short, it is an excellent species for adding refreshing color to shaded woodlands with protection from direct sunlight. I was surprised when I first read the Flora of Japan (Iwatsuki et al. 1995) to find it described as evergreen. While I doubt that their "evergreeness" extends beyond light frost zones, my plants have supported the descriptive text by duly holding their fronds throughout the mild winters of 2004 and 2005. Even in colder climates, this species maintains its fronds well into cold weather. 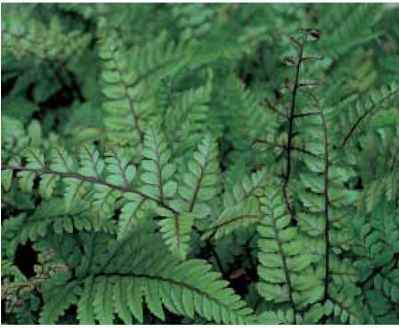 Athyrium otophorum is one of the numerous ornamentals that have been introduced to the U.S. trade by Judith Jones of Fancy Fronds Nursery. Var. okanum with stalked pinnae is more commonly available than the type. Subtle shades of lime and wine on Athyrium otophorum.